The purpose of this forum is to engage with our communities homeless and its leaders. Our guest speaker, Ibrahim, has facilitated many forums and discussions on the root causes and issues that encompass the houseless community. He has advised City Officials, Community Leaders, Neighborhood Associations and the Business Community on many issues including presentations for training police, park rangers, government officials, and social service workers when in communications with the Houseless. 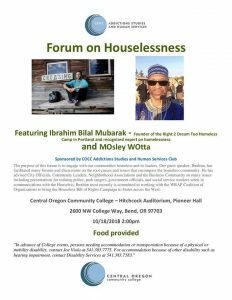 Ibrahim most recently is committed to working with the WRAP Coalition of Organizations to bring the Houseless Bill of Rights Campaign to States across the West.